9:17 - 9:23 Heritage Museum (4 pictures) ... bronze sculpture of Stone ram, a replica of the largest ever taken. 9:24 Edge of town ... Duke Energy ... Whitehorse 973 km. (604.6 miles). 9:27 Large herd of bison with lots of babies behind a fence along the road ... white spruce, poplar and aspen forests. 9:33 Bison to the left. 9:34 Passed a small motor home with a Swiss licence plate. 9:37 Open area to left with very distant views. 9:41 Junction with BC-77 to Fort Laird ... from here to Muncho Pass the road, for the most part, runs in an east west direction. 9:44 Densely forested ... wild roses in flower ... another gray day, but so far we haven’t had any rain ... area is considered The Northern Rockies - much more rolling. 9:48 Ceiling low - can see mountains out there. The road is like a parkway with trees cleared well back from the road - grassy and green. 9:51 Stand of aspen at the top of the embankment to the right - tall white trunks. 9:52 A couple of ridges in front of us. 9:54 Sign: Winding Road next 5 km (3.1 miles). 9:56 Direction indicator showing that we are traveling south! Mountains to the right! 9:57 Crossing Kledo Creek, which flows into the Kledo River, a tributary of the Muskwa River ... deer. 10:00 Can certainly see the mountains now, clouds hiding their peaks. 10:08 Cloud down in the valley to the right. 10:10 Distant view to the right - seems to go for ever. 10:12 Climbing Steamboat Mountain, a long winding climb and going into the clouds. 10:13 Through a rock cutting to a pullout where we turned around to go back to Steamboat ... the cloud seems to thicken as we descend. 10:15 - 10:21 Historic Milepost 351 - Steamboat ... then back on the highway and climbing the mountainside into the clouds. 10:23 Through rock cutting for the second time and back to where we turned around - small waterfall coming down the cliff. 10:24 Another rock cut ... visibility virtually “0" ... a New Jersey barrier all the way up the hill from Steamboat. 10:25 Passing a viewpoint! Nothing but clouds!. 10:26 Top of the climb and end of New jersey barrier. 10:28 Descending, barriers to the left, then to the right and sometimes both sides. We came down out of the clouds, knowing that we were certainly in mountains. 10:31 Sun shining, but from the back seat I couldn’t tell from where. 10:32 Can see the road way over on the other side of the valley ... still descending. 10:33 Crossing a stream and going around a “U” bend to climb up the other side. 10:36 Tetsa River and Tetsa River Regional Park and Camp ... deer. 10:37 Ascending and a sign: “Road Narrows”. 10:40 A nice distant view ahead. 10:41 We look to be going into another big valley. 10:42 Landslide area to the right - the embankment has slipped. 10:45 Some pretty big trees ... sunshine. 10:47 Trees right up to the road on the right. 10:48 Pulling off the highway at Tetsa River Guest ranch ... Historic Mile 375. 2,557.2 10:49 - 11:16 Tetsa River Outfitters, “Cinnamon Bun Center of the Galactic Cluster.” Here we enjoyed a cinnamon bun (yum yum) - C$3.21 ... (I took pictures inside) ... after such a feast we didn’t need anything else for lunch besides some trail mix! 11:18 High rock cliffs and rock fallen on the right, Tetsa River on left ... blue flowers which look like little bells can be seen as the road follows the river valley. 11:21 Pools of water on the right between the road and the cliffs ... the sun is shining and there is some blue sky. 11:24 A pile of road metal to the right ... lupines ... now a much more interesting drive. 11:27 Starting to cross the Tetsa River bridge # 1 - metal. 11:28 - 11:40 Walked the trail to see the bridge ... I took pictures of flowers, including blue lupines, bluebells and moose turds. 11:42 Tetsa River bridge # 2 ... signs both sides for rock falls. And, boy! A lot of rock has come down, too. 11:45 A little bit of snow. 11:48 Sign: Stone Mountain Provincial park. 11:50 Leaving after a picture of Stone Mountain ... Summit Lake 2 km (1.2 miles)... Mt. St. Paul. 11:53 Leaving after seeing cariboo. Entering Summit Lake ... a pair of loons on the lake. 11:55 Communications tower on top of a mountain ... that was the summit of the road, the highest summit on the Alaska Highway, Summit Pass, El. 4,250 feet ... there were gorgeous views of rocky mountains. 11:58 Top of a hill. 11:59 Sheep all the way down ... road clinging to the mountainside ... steep precipitous rock cliffs ... 6% downgrade. 12:03 Leaving after a series of pictures ... very wide river valley. 12:05 Canyon and streambed to the right, then passing Rocky Mountain Lodge ... the braided streambed and river is very rocky. I was reminded of the river valley I viewed from the plane when flying over the south island of New Zealand. 12:07 Just as leaving the Provincial Park, a mountain to the right a flat slanting rock side and is very rugged on the other side. 12:09 Snowy Rockies to the left. 12:10 Watson Lake 365 km (226.8 miles). 12:11 113 Creek, named during the construction of the highway for its distance from Mile 0 at Fort Nelson (MP p. 143) ... Stone Range to the northwest and the Rocky Mountains to the west. 12:13 Crossed 115 Creek ... great variety of greens on the mountainside to the right with the sun shining on it. 12:14 Momentarily back by the river. 12:15 Mountain to the right is grassy and looks as if it has been cleared (?) ... This is a very scenic section of highway and has been almost since leaving Fort Nelson. 12:23 Leaving after pictures of cariboo and crossing the MacDonald River which is now to our right. 12:26 It is very beautiful here driving along the river. 12:28 Pink of the wild rose, blue of the bluebells, yellow of the dandelions, greens of the grass and trees, the mountains - beautiful. 12:31 Folded mountains by Racing River which runs between Stone and Sentinel Ranges. 12:33 - 12:34 Stopped for construction ... gravel along this stretch of road. 12:36 Multi-plate culvert - 4 gauge steel plates bolted together - being installed for a side stream. 12:37 End of construction and back on pavement. 12:39 Crossing Racing River (Dawson Creek Mile 400.7). 12:41 Fenced meadow on left, then a new log house, also some horses. 12:42 Coal seam or something very black in the embankment cliffs on the right. 12:44 Entering Toad River - Historic Mile 422 ... 3,000 foot airstrip, El. 2,400'. 12:47 Pictures: deep pink flower and mountain view. 12:48 Lots of lupines along the shoulder. 12:49 Passing Poplars Campground and Café ... Historic Mile 426. 12:51 Beautiful view of mountains to the right. 12:52 Entering Muncho Lake Provincial park. 12:55 Pictures from the car of folded mountains. 12:56 - 12:57 Interpretive Marker. 12:59 Moose disappearing into the trees on the left. 2,609.7 1:00 Driving along Toad River, the waters really racing - whitewater raft trips available. 1:02 Right alongside the river bank. 1:04 The river winds away from the road. 1:06 The road is at the base of very high cliffs on the left, some slopes become vertical. 1:11 Leaving after pictures of the river and the Flash Flood marker and waterfall. 1:14 Crossing Toad River and now we are on the right side of the river valley. 1:17 Still seeing folds in the mountains to the right. 1:19 Muncho Lake 21 km (13.0 miles) ... wonderful mountain views ahead, some of them clouding over ... still a lot of snow on the upper slopes, also clouding over. 1:21 However, we have turned away from that valley. 1:22 Road climbing through rock cuttings. 1:23 Some rough patches of road ... steep climb ... a lot of fill to build the road. 1:26 Mountains to the right are bare and fairly smooth ... going north at the moment. 1:29 Area now heavily forested. 1:31 Bare mountains behind the trees - hills and wide rocky braided river bed with a small stream flowing through it. 1:33 Road down at river level and crossing Muncho Creek. 1:35 Entering Muncho Lake (pop. 29; El. 2,700 feet) ... businesses extend along the east shore of Muncho lake ... the road is between the base of the cliffs on the right and the lake on the left. 1:39 - 1:43 Muncho Lake - a number of pictures ... the road continues around the shore of the lake which is 7 miles long - lake elevation is 2,680 feet. NOTE: Milepost p. 145 - Daily Life - Blazing a trail north. 1:46 Pile of logs retrieved from the water. 1:49 Northern Rockies Lodge - Historic Mile 462 ... Twin Otter plane. 1:54 Stores and motels (end of Muncho Lake businesses). Sign: Carry chains or use good winter tread tires. 1:56 Fantastic slide area up ravine to the right. 1:57 Laird 50, Watson lake 263. 1:59 Incredible slide area to the right. 2,648.8 2:01 Sheep on the side of the road - they were losing their wool and looking ragged. 2:04 Mountains on the right, flat faces to the SE are bare, but the other side is treed. The mountains surrounding the lake are approximately 7,000 feet high. ... wonderful valleys ... amazing. 2:10 Top of hill ... extensive view of valley. This is also the first decent day we have had since leaving. 2:12 Bridge crossing Trout River which is flowing very quickly. 2:15 Whitewater on the Trout River. 2,659.8 2:16 Crossing Prochniak Creek ... Going by our original itinerary, we were supposed to be in Whitehorse by tonight! - 406 miles beyond Liard. 2:22 - 2:23 Wild horses, about 15 to 20 of them. 2:25 Sign: SLOW - VERY DANGEROUS CURVE ... wild roses have been flowering at the side of the road for many miles. 2:29 Sign: CAUTION - Buffalo on Road ... we didn’t see any! 2:31 Valley to the right suffered a fire in 1957, so is reforested ... also big rocks have fallen down to the road on the left. 2:33 Near Washout Creek (picture from car window). 2:37 - 2:41 Stopped for construction just before the Liard River bridge, El. 1,400 feet, a 1,143-foot suspension bridge, which is the only remaining suspension bridge on the Alaska Highway. We are waiting in line for the pilot car which is leading the traffic from the opposite direction. 2:42 Over the river ... the wild roses are simply beautiful. 2:46 Liard River Hot Springs Provincial Park campground ... opposite was a lovely log building ... we were mixed up in a line of vans all turning into the park and we were waiting to turn but still in the line being led by the pilot car - what a mess! We went on without stopping to see or swim in the hot springs - bit of a disappointment because both Jo and I had talked about taking our swim suits specifically for Liard Hot Springs! 2:49 We are still following the pilot along gravel road at 20 mph. 2:51 Sandy embankment to the right. 2:52 Crossing a multi-plate culvert. 2:55 The pretty green leaves and the white trunks of the aspens really stand out. 2:57 At 15 - 20 mph ... Coal River 53 km (32.9 miles) - Fireside 69 km (42.9 miles) - Watson lake 206 k (128.0 miles). 2:58 End of flagman, but not end of construction! 3:00 Back on pavement ... wouldn’t want to slip off the road - shoulder at least a foot below the edge of the road. 3:04 Road curving around the mountain on the right ... wide river to the left - Liard River. 3:06 We are right at the side of the river. 3:08 Judging by the trees a fairly strong wind is blowing. 3:10 Lots of blue flowers again but I cannot identify them as we drive by ... “Tunnel of trees” - Jo’s description - “Tree canyon” - my description ... whichever way you want to describe the view all there is to see is the road going through the forest ... we seem to be away from the massive mountains, though the area is still mountainous. 3:13 Crossing Smith River bridge ... the Smith River falls are located 1.6 miles away via a gravel road (see MP p. 148). 3:22 The Liard River continues to flow to our left ... This is a beautiful drive. 3:24 Huge river - very wide, still the Liard. 3:31 Entering Coal River - Historic Mile 533. 2,712.5 3:32 - 3:49 Coal River Lodge ($1.00 for use of facilities if not a customer) ... Bumbleberry Pie was very good (made with rhubarb, apples, raspberries and blackberries. 3:50 Coal River bridge (Historic Mile 533.2) ... Coal River is also large and flows into the Liard just south of the bridge. 3:53 Beautiful distant view of the ranges ahead ... road is winding around ... sometimes we (the road) is up and sometimes down but more or less are following the valley of the Liard River. 3:55 The Liard River has gone off to the left and our road to the right. 3:58 835 km (518.8 miles) (milepost). 3:59 Back by the river. 4:00 Entering Fireside - Historic Mile 543 ... ‘82 fire - second largest fire in BC history (see MP p. 149) ... some tree trunks are still standing. 4:01 Liard River and Cranberry Rapids. 4:02 Adjacent the river again and going uphill. 4:04 Near river level, but can’t see it, then the road climbs uphill away from the river. 4:06 At the top ... there looks to be a road on the other side of the valley! - not the valley where the river is located ... Iron Creek 72 km (44.7 miles), Watson lake 127 km (78.9 miles). 4:11 Such a vista ... can see our road and another to the left. 4:20 Still passing through the burn area from the big fire. 4:22 Momentarily back by the Liard. 4:23 - 4:34 Historic Mile 570 - Allen’s Lookout (see MP p. 149) ... cairn ... survey marker ... Liard river. 4:35 Back on the highway. 4:40 Two pictures from car window of the 2004 burn and rocky mountain. 4:41 Sloughs to the left. 4:44 On a ridge with distant views to the right ... out of the burn area. 4:45 Ellen Lake to the right - beautiful. 4:47 A road off to the right looks like the old road. 4:50 - 4:51 Welcome to Yukon (take picture from car). 4:53 Historic Milepost 588 - Crossing Contact Creek (see MP p. 149-150). 4:55 Passing Contact Creek Lodge - Historic Mile 590. 4:57 The sun is still shining but dark clouds are gathering overhead and our beautiful day could come to an end! 4:58 Rain can be seen out to the left. 4:59 Crossed a small rushing stream - Iron Creek. 5:00 The sun has disappeared. 5:01 Passing Iron Creek Lodge, Mile 596 ... blue sky and sun sure make a difference. 5:05 Rain spots on the windshield ... the vortex off the end of a trailer whips up a lot of dust ... area heavily forested. 5:07 Top of steep hill - not long but has a curve at the bottom. 5:08 The road is wet ... log-stemmed dandelions. 5:09 7% downgrade, then a curve. 5:10 Crossing a big river (flooded), the Hyland River, a tributary of the Liard. 5:13 The weather has deteriorated, sky very overcast. 5:18 Blue sky to the right ... we are driving southwest. 5:20 Going down into another valley ... the road is winding around, Liard River still off to our left. 5:22 Muskeg to the right. 5:23 Turnoff for Lower Post First Nation. 5:24 MP 960 km (596.5 miles) ... and back in sunshine. 5:28 Road winding around the side of a hill above the valley. 2,798.7 5:30 Historic Milepost 627 marks the official YT-BC border ... left BC-97 for YT-2. 5:31 A beautiful sign: YUKON - True North ... did not stop but may come back later. 5:32 Sandy embankments ... Lots of billboards for Watson lake. 5:35 Welcome to Watson lake ... we pulled into Campground Services. 5:36 - 5:45 Got a campsite - # 136 ... I paid C$10.00 + GST $0.70. 2,804.1 5:47 Arrived at campsite ... we got the camp set up, then sat in the tent through a shower ... walked over to the ablution block and back with water ... prepared supper - jambalaya (very good) ... but we could see the darkness rolling in, then thunder ... served supper before the rain came and sat in the car to eat it just as it started to rain (rice was a little chewy!) ... thunder and lightning and heavy rain - the windows are fogging up! The people in the campsite next to us were from Florida and had “hurricane food” for their supper - just add water to the brown bag and wait for it to heat! 8:58 Drove over to the washrooms. 9:11 Leave for drive south to the Yukon sign. 9:25 Saw a lovely fox. 9:26 - 9:27 Watson Lake sign ... Watson Lake elevation 2,265 feet. 9:28 Passing the campground to drive into town. 9:30 The sun is still quite high in the sky, but hidden by clouds. 10:10 Leaving Sign Post Forest. 10:16 Turning into the campground ... sunset colors in the sky. 10:30 The sun came from behind the clouds and was shining on the trees ... it was still light when we turned in for the night. 2,816.4 End of the day. This morning whilst we were finishing up packing the car 2 trumpeter swans flew over us, right above us. We had hot cereal for breakfast and toast with apple butter (so good). 2,816.4 9:02 Leaving the campsite. We cleaned the car windows and whilst Sam was paying for the gas I watched swallows flying in and out of their nests under the eaves. It is a beautiful morning and the sun is shining. 9:23 - 10:11 Sign Post Forest. This was lots of fun looking for signs from places we recognized (e.g. Timmins, Ontario - where LP was born). At the Visitor Center we saw an 18 minute movie - building of the Alaska Highway. 10:12 On the highway and on our way for the next leg of our journey - Whitehorse 445 km. (276.5 miles) - and back into trees. There are also billboards on the other side of the road for those traveling south. 30,000 people live in the Yukon Territory and most of those are in Whitehorse. 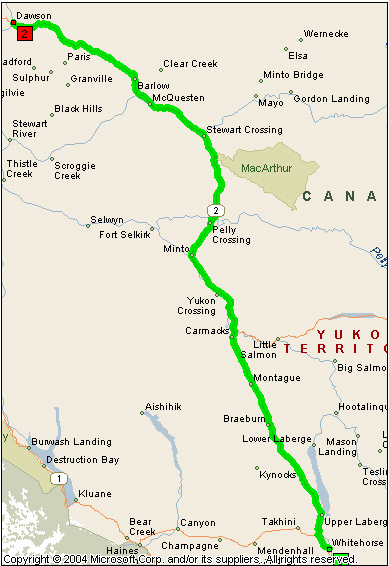 Log for the Alaska Highway continues on p. 159 of the MILEPOST. 10:17 Around a curve and on top of a hill with a distant view of snow-capped mountains. 10:18 Welcome to Upper Liard - Historic Mile 642. 10:19 Crossing Liard River - very wide - Upper Liard Bridge ... Liard River heads in the St. Cyr Range in south central Yukon ... a pretty church - Our Lady of the Yukon Church. 10:20 Crossed Albert Creek ... first tree planting project in the Yukon - white spruce (see MP p. 158). 2,831.2 10:25 The 1,000 km. Milepost. 10:25 The junction with Rte 37 south, the route we will be taking on our return. 10:28 The embankment on the right has lots of names laid out in small round rocks ... lupines to the left ... names continue on left embankment to !0:31 ... more names. It was the Fort Nelson Swim Team which started the rock names. 10:32 Names continue both sides ... in between the embankments the road is built up above the right of way. 10:34 Two lakes in between the trees on the right. 10:37 NorthwesTel microwave tower on the right. We are driving towards the mountains and keep getting glimpses of them. There would not have been the same vistas on the pioneer road as the trees would have been much closer. One reason for the very wide right of way is that by keeping the trees so far back from the road there is a better chance of seeing wildlife sooner and thus many an accident being prevented, also less slaughter of wildlife. 10:39 What a vista! Trees, a lake to the right and the mountains. 10:40 A slough to the left ... this section of the highway has an excellent surface ... the clumps of dandelions provide lovely color. 10:45 Approaching bridge crossing ... re-decking the bridge ... single lane across bridge. 10:46 Green for us ... crossing the Little Rancheria River, a fast flowing stream. 10:47 Mountains to the right. 10:50 Approaching another bridge which is also being re-decked and traffic is light-controlled. 2,857.0 Crossing Big Creek which is very fast flowing. 10:53 Clumps of lupines, adding a lovely blue along with the yellow of the dandelions. 10:57 What a gorgeous vista looking over the trees, the road winding through the hills and the snow-capped mountains ahead. Sam told Jo and me that we were not to use the words gorgeous, beautiful, fantastic, amazing and so on more than 7 times per day!. 11:00 Top of another hill and another vista! 11:01 Microwave tower on the right ... long descent into the valley. 2,869.9 11:03 Crossing Lower Rancheria river - also a good size. 11:04 The road is built up a lot - tons of fill have been used ... canyon and rock formations to the left. 11:08 Pretty little lake to the right and smooth mountain with snow on it to the left. 11:09 Rock cut on the right. 11:11 Crossing Spencer Creek - creek bubbling along. 11:12 River to the right ... wonderful view towards the mountains ... we are getting closer to them .... Cassiar Mountains. Poor Sam, having to put up with two women! But sometimes .........”I just got by that guy and I’m not doing it again” in response to Jo’s wanting to stop. 11:17 George’s gorge, but we couldn’t see anything ... lake on the left. 11:19 Mountains just ahead, the one in the center looks like a pyramid. 11:20 NorthwesTel microwave tower to the left (south) as the road veers to the right and goes downhill ... the “pyramid” disappears from sight. 11:22 Right alongside the Rancheria River, full to the top of its banks. 11:23 Rocky slopes to the right (black lava-type looking rock) ... we are traveling west so the mountain range we could see from the various vistas is to the south. 11:25 Mile 687.2 - Historic Milepost 710 ...Passing Rancheria - camp and supplies. 11:25 More black rock and cliffs with columnar jointing to the right ... rocks to the left on the other side of the river and a number of rushing streams. 11:32 Rest Area - Rancheria Falls Recreation Site ... point of interest - message board. 11:33 Porcupine Creek ... beautiful view of the Cassiar Mountain Range which is to our left and back. 11:34 A different range of mountains ahead, snowy and tree-covered hills between. 11:36 Historic Mile 721 (Mile 698.4)Continental Divide Lodge ... crossing Upper Rancheria River. 11:37 - 11:43 Continental Divide (MP p. 160) ... from here we turned back to the lodge. 2,905.8 11:46 - 12:11 Continental Divide Lodge ($6.48 - cabbage and ham soup with sourdough bread, but I didn’t get a single piece of ham! 2,907.6 12:13 Passing Continental Divide, the point at which we turned around, and just after this we spotted a bear along lakeside to the right, but there was no point in backing up. 2,909.4 12:16 Crossing Swift River culvert ... the road is climbing and descending as it winds through the mountain range. 12:23 Crossing Seagull Creek ... Historic Milepost 733 - Swift River lodge. 12:24 Historic Mile 733.5 - back in BC for about 42 miles and driving south. 12:26 Milepost 1140 km ... crossing Partridge Creek. 12:27 So many broken-off trees. 12:29 Alongside the Swift River. 12:33 Passing Swan Lake Rest Area (Historic Mile 743) ... the scenery is just a feast for the eyes ... magnificent. 12:36 Still seeing Swan Lake - big. 12:39 Whitehorse 264 km (164.0 miles). 12:40 Logjam Creek ... came around a corner and another distant mountain range. 12:45 Overlooking a large burn area. 2,942.1 12:48 Crossing Smart River (see MP p. 161 - Mile 735.8) ... still seeing the Cassiar Mountain Range to the south. 12:53 Microwave tower on top of a hill to the right. 12:55 Road built up over gully ... a pond to the right - a beaver lodge in the middle of it. 12:57 Lower Hazel creek ... lake to the right. 12:59 Teslin Highway Maintenance section. 1:00 Andrew Creek ... Morley Lake to the north. 2,957.5 1:03 Leaving BC, the last of 7 crossings of the YT/BC border. 1:06 Whitehorse 219 km (136.1 miles). 1:17 Magnificent view across the top of the trees and the lake to the mountain range. 1:19 We always know when we are coming into civilization - adds. 1:20 Dawson Peaks to the left. 1:23 More flowers including wild roses. 1:26 Welcome to Teslin ... Sign for Mukluk Annie’s Salmon Bake. 1:27 - 1:35 Rest Area overlooking Nisutlin Bay Bridge (see MP p. 162) and Teslin. 1:36 Nisutlin Bay Bridge - open metal decking ... Nisutlin River forms a bay as it flows into Teslin lake ... Teslin, a bigger community. 1:38 Whitehorse 181 km (112.5 miles) - a good stopping place. 1:39 Driving along the shore of Teslin lake (MP pp. 162 - 163). 1:42 Microwave tower to the right at the top of a hill. 1:43 By the lake again, but a little higher up. 1:46 Passing Mukluk Anie’s (Historic Mile 812) ... it is also a campground. 1:47 Ten Mile Creek and back by the lake ... gorgeous views all along the lake. 1:50 Lone Tree Creek ... beautiful lupines. 1:51 Sign: No Sheep Hunting in this area. 1:58 Views ... views ... views - got to be careful not to exceed the number of superlatives Sam has stipulated!! ... lupines in abundance. 2:02 Historic Milepost 829 - Brooks’ Brook. 2:05 - 2:06 Big ravines ... up from lake and back into hills. 2:09 Junction with YT-6 ... cutting as the road descends to the Teslin River ... Teslin River Bridge, 1,770 feet, third longest water span on the highway - MP p. 165. Historic Milepost 836 - Johnson’s Crossing, one of the highway’s original lodgings. 2:14 Milepost 1302 km (809.0 miles). After crossing Teslin River the road takes off in a different direction - little to see but trees, mostly pine, and glimpses of mountain ranges. 2:20 Crossing a ravine, and there was a small lake, Salmo Lake, to the right. 2:21 Crossing Seaforth Creek ... large lake to the right, Squanga Lake. 2:23 Still seeing Squanga Lake to the right. 2:28 White Mountain (MP p. 167) to the south. 2:30 Purple flowers ... we took them to be Jacob’s ladder because in the MILEPOST on p. 167 (DC 816.8) it stated: In mid-June, the roadside is a profusion of purple Jacob’s ladder and yellow dandelions. We certainly saw plenty of dandelions but the purple flower looked more like vetch to me and I have since identified Jacob’s ladder as a totally different flower. Besides it wasn’t mid-June yet! 2:31 Interesting rocky mountain to the left - no name! 3,039.9 2:34 (1,338 km, 831.4 miles) ... coyote on road. 2:38 Historic Milepost 866 - Jake’s Corner (MP p. 167) ... also the turnoff for Carcross, which is on the way to Skagway ... Fairbanks 1094 km (679.8 miles). 2:45 A group of cyclists, bikes loaded with camping gear - have seen quite a number of them in recent days. 2:48 Passing the turnoff for Judas Creek subdivision. 2:49 Slough on the right. 2:51 New Constabulary subdivision ... then Old Constabulary subdivision. 2:53 View of Marsh Lake (MP p. 168) to the left - 25 miles long. 2:55 M’Clintock Place - lots of mailboxes. 2:56 Back by the lake ... Whitehorse 53 km (32.9 miles), Dawson 578 km (359.2 miles) ... driving along shoreline - can see lots of houses or cottages around the lake (great resort for folks from Whitehorse). 2:59 Still by the lake. 3:00 Sign for Swan Haven, M’Clintock Bay. 3:02 Turning off the highway ... lots of mailboxes ... winding gravel road ... by the lake ... some houses ... back into the trees ... more winding road ... some very nice houses back here. 3,069.0 3:09 - 3:22 Swan Haven Interpretive Center ... a number of pictures ... the docks appeared to be very high, may be used for bird viewing ... or the water level was very low! 3:27 Back on the highway. 3:28 A very rocky mountain to the right with the road at its base. 3:31 Sign: Takhini Hot Springs. 3:34 - 3:53 Turned off for Yukon River and Marsh Lake Dam. Most of the territory is in the watershed of its namesake, the Yukon River (a North American river flowing into the Bering Sea) . The southern Yukon is dotted with a large number of large, long and narrow glacier-fed alpine lakes, most of which flow into the Yukon River system. The larger lakes include: Teslin Lake, Atlin Lake, Tagish Lake, Marsh Lake, Lake Laberge, Kusawa Lake, Kluane Lake. Lake Bennett, B.C., on the Klondike Gold Rush trail, is a smaller lake flowing into Tagish Lake. We walked up the trail to the overlook on the top of the cliff ... a variety of wildflowers were blooming, one of which I have since discovered was Jacob’s ladder .. A bald eagle flew overhead. 3,077.2 3:54 Back on the highway and crossing the Yukon River bridge. 3:55 Pretty view to the right of the cliffs reflected in the river ... then sandy embankment. 3:56 Start of billboards advertising for Whitehorse, including Tim Horton’s. 3:59 Stopping for a school bus with flashing red lights. 4:02 Reduce speed ... South Klondike Highway, YT-2, to the left. 4:09 Sign about 135th meridian. 4:10 Lots of blue/purple flowers to the right. 3,090.5 4:11 Historic Milepost 911 ... mountain covered in huge rounded rocks. 4:14 Turning off the Alcan at Robert Service Way. 4:15 Traffic lights! It seems forever since we saw a traffic light! 4:16 Turning off to the right for Miles canyon. 4:18 Driving along the river bank (Yukon River). 4:25 Turned around to go back along Miles canyon Road. 4:30 Back on Robert Service way. 3,099.5 4:45 Campsite 61 ... We set up camp, then made supper: left-over penne, bacon, mushrooms (dried) and spaghetti sauce, salad, chips and fruitcake. 7:35 Left to drive into town. 7:39 - 8:06 S.S. Klondike National Historic Site. 8:12 - 8:54 Went to the Superstore first, then to Wal*Mart. 9:08 - 9:13 Canada Trust. After this we drove up Main Street to the end and turned around. 9:17 Sun shining on the mountain peaks ... drove up and down a number of streets. 9:20 The sun still has not set. 3,107.5 9:25 Back at camp - end of day. 3,107.5 8:50 Pulled out from campsite, sun already high in the sky ... it was a chilly morning and the coldest night so far ... breakfast: cold cereal and toast with apple butter. Last night I stopped reading about 11 o’clock - no lamp or flashlight! It was hard to get to sleep with the light, the traffic on Robert Service Way and the talking of people around campfires. I woke up around 6:30 and the sun was already high. This was our first dry night and this made it much easier to pack the tent. We talked to our neighbors at the adjacent campsite, a man and his two daughters who were heading out for Inuvik - they ate their instant cereal for breakfast directly from the package it came in - just added hot water! Now, before leaving town, we are going to the Superstore to replenish supplies. 8:55 - 9:00 Two pictures downtown. 9:04 - 9:19 Superstore (C$6.24 - ground meat, lettuce, ham - Self). We left Whitehorse via Two Mile Hill. 9:23 Turning south (or maybe east!) To go to the airport. 9:26 Turning off the highway into the airport. 9:27 - 9:34 Woolly Mammoth and Giant Beaver, Yukon Beringia Interpretive Center http://www.beringia.com/ - took pictures but did not visit. 9:35 Back on the Alcan and heading north. 9:40 Going through a deep cutting. 9:42 Can see a range of mountains which would be on the other side of the Yukon Rive. 3,122.3 9:46 Turning onto the Klondike Loop, YT-2 (Klondike Highway) to Dawson City, YT-9 (Top of the World Highway) and AK-5 (Taylor Highway) - see MP p. 271. Dawson City 519 km (322.5 miles). 9:49 Crossing the Takhini River, and looking to the right we can see its confluence with the Yukon River. There was a sign, “Leaving Whitehorse” just before the bridge. The embankments along the route are quite sandy. Quote on the back of a motor home from Oregon - “Going To Be Gone”. 9:54 Microwave tower high up to the left. 9:59 Crossing Horse Creek ... purple flowers ... road climbing, then descending, the rocky mountains are to the right. The rocks on the mountains are rounded and if they were in the valley I would say they looked as if they may have been smoothed by glaciers. The trees, mostly deciduous, have been much smaller so far. 10:02 Flat field to the left being irrigated. 10:04 Plugged in camera to recharge battery. Mile 20.3 - turnoff for Lake Laberge (MP p. 273-274) ... also Drifting Home by Pierre Berton, Day Four, p. 48 ... also made famous by poet, Robert Service in his poem, The Cremation of Sam McGee. 10:05 40 mile long Lake Laberge is to our right. 10:07 Now there are also pine trees. 3,144.9 10:11 Fox Creek ... plateau country of the Yukon ... the road has been winding ever since crossing the Takhini River. 10:14 A marsh to the left and a beaver lodge. 10:16 Lake, Fox Lake, to the left goes on and on. Mile 29.2 - missed a turnout on Fox Lake - for point of interest see MP p. 274. Yukon has done a much better job of marking their roads than northern BC. 10:22 Driving along and slightly above the lake which is a very pretty blue. 10:23 Turning into Fox lake Campground ... beautiful clear lake ... several pictures. 10:34 Back at the highway, Sam looked at the stick tripod with survey tape - sticks so new they are still sprouting ... iron pin in the ground with little plastic disk about the size of a dollar coin ... the disk is numbered by the Yukon Engineering Service. 10:38 On our way ... plugged in the camera again - disconnected whilst stopped. 10:42 ‘98 - major forest fire ... start of burn area ... many of the old burned trees are still standing ... has not come back as rapidly as in some places ... little regrowth through the valley nor on the mountains both sides of the valley. 10:47 Some road repairs, then back on the lake. 10:48 End of roadwork ... Little Fox Lake - trout (grayling in the other Fox Lake) ... the burn area continues. 10:49 Mile 44.2 - Sign: Leaving 911 zone northbound. Lake Laberge is in the next valley over. Still in burn area - sure was a major fire. 10:52 Jacob’s ladder lining both sides of the road. 10:56 Passing the Boreal Fire Interpretive Site rest area. 10:57 Winding downhill - lake still ahead and to the left. 10:58 More or less leaving the burn area. 10:59 Sign: 1958 Forest Fire ... more vegetation but probably slow growing. 11:01 Passing Braeburn Lodge (see MP p. 274) brags of a cinnamon bun that will feed 4 people ... we did not stop, not even for a bun, “the point being, we have over 300 miles to go!”. The lodge is also an official checkpoint for the 1,000-mile Yukon Quest International Sled Dog Race ... the airstrip to the right at an elevation of 2,350 feet dubbed Cinnamon Bun Strip. [ Sue Henry, eng. Prof at U of A Anchorage ... in my notes, but why?] I have since found that she wrote a book Murder on the Yukon Quest (1999). http://www.fantasticfiction.co.uk/h/sue-henry/ . 11:11 Interesting ridging on the hill to the right. 11:13 Mile 65.7 - I would like to have seen Conglomerate Mountain! There was an interpretive marker and an example of the geological material as well as out-cropping up the hillside ... lots of Jacob’s ladder flowering. 11:18 Twin Lakes, one on either side of the road. 11:19 Riser Lake on the right ... Dawson City 405 km (251.7 miles). 11:26 Trees are closing in on both sides, but the mountains beyond on the right are fairly bare except for rocky outcropping. 11:32 Unplugged the camera when orange light was solid. 11:33 Hillside covered with fescue grasses. This is another glorious day, which is most welcome. 11:37 Cyclist (loaded) going south. 11:40 Road winding at the base of fairly steep hills to the right, grass covered, some rocky outcropping, also patches of trees - a pretty drive but not really spectacular. 11:41 Trees both sides of the road. 11:42 Mile 93.3 - Sign at the side of the road: Plume Agate Flume (I have been on the web and can’t find any information about this). The MP (p. 275) mentions information sign about agate deposits, but that’s all! Jo remarked, “The textures on the hillsides are just amazing.”. 11:44 Splashes of color - Jacob’s ladder or whatever it is. 11:45 Slough to the left and trees have replaced the grass on the slopes to the right. 11:46 Carmacks 2 km (1.2 miles)... cliffs on the mountain to the left have reddish rock exposed. 11:48 Mile 99.3 - Entering the village of Carmacks. ... a golden eagle soared overhead ... it also dived down to scare off another bird, maybe a raven. Seagulls were also to be seen. 12:23 Crossing the Yukon River, which was plied by steamers until 1953. This is the only highway crossing of this river between Whitehorse and Dawson City. 12:24 Turnoff for the Campbell Highway (YT-4) to Faro, Ross River and Watson Lake. 10:26 Turnoff to the left for the Nordenskiold River. 12:28 A small patch of gravel. 12:31 Slough to the left ... another gravel patch. 12:36 Back into spruce trees. 12:40 A cyclist working hard uphill in the opposite direction - he was also pulling a bicycle trailer. We decided against descending the 219 steps of the wooden staircase to the cliffs overlooking the rapids! 12:50 Patch of loose gravel ... hill. 12:51 Crossing Tatchun Creek and up the other side. 12:58 Road enclosed in trees, like driving down a canyon. 1:02 Road winding up the mountain above the river, then into trees again ... also passing the 400 km (248.5 miles) marker. 1:07 Start of the area of the 1995 fire - 325,000 acres burned. 1:08 Mile 134.7 - Distance marker: Pelly Crossing 56 km (34.8 miles), Dawson City 308 km (191.4 miles). The road looks to be the break point of the fire! Mile 135.6 - MP p. 276: volcanic ash, also white under roots of fallen trees. 1:17 Crossing McCabe Creek ... gravel road for quite a stretch ... still in burn area. 1:20 Microwave tower way up on a ridge to the right. 1:22 Back on pavement ... Sign: River Trips to Fort Selkirk. 1:23 A tour bus traveling south. 1:24 Turning away from the Yukon River and valley as the road climbs. 1:27 Men working ... STOP ... loose grave (still in burn area). 1:29 Slough to the right. 1:33 L’hutsaw Lake to the right ... and maybe the end of the burn area ... road enclosed by trees and view ahead of mountains in the distance. 1:36 Another 1995 burn area. 1:37 Rock Island Lake to the right ... this is a shallow lake where American coots nest - these birds are not often seen in the Yukon. 1:38 Roses and dandelions as well as vetch (Jacob’s ladder) ... the dandelions and vetch look gorgeous together. 1:42 Meadow Lake to the left - note the white salt deposits on the stumps (MP p. 276 - “This shallow lake is an athalassic or inland salt lake.” ... snow on the mountains in the distance ahead. 1:45 Lots of wild roses. 1:48 - 1:49 Stopped to change drivers. 1:50 Mile 168 - Starting to cross Pelly River - huge ... I am just amazed at the number of such big rivers we keep seeing! 1:51 - 1:56 Looking down on Pelly Crossing (MP p. 276) - pictures of the river and signs. 1:58 Airstrip to the east, El. 1,870 feet. 2:00 Rough patches of road ... also another burn area. 2:07 Small lake to the left ... burn area and new young forest ... lovely vistas from time to time. 2:11 Mountain with snow on it straight ahead. 2:12 Back in aspen trees ... some spruce. 2:14 Microwave tower to the right. 2:15 Big piles of trees both sides from clearing right of way and making it wider - both sides - piles continue for a couple of miles or more ... lots of firewood! 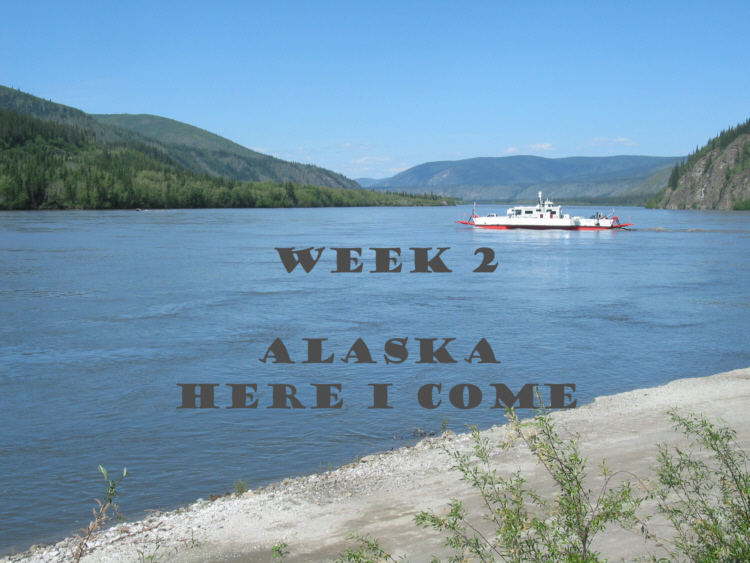 2:21 Dawson City 210 km (130.5 miles). 2:22 Slough to the left. 2:24 508 km (315.7 miles) marker - steep descent ... 514 km (319.4 miles) - still going down. 2:29 516 km (320.6 miles) - flattened out a little, but I think we are still going down. 518 km (321.9 miles) - we are going up. 2:32 Steep descent on curve. 2:33 Crossing Crooked Creek, then climbing. 2:36 Small lake to the right (Jo drives a lot faster than Sam!) ... motel ahead. 2:39 Roses, vetch and pale pink flowers. Mile 211.6 - Stewart Crossing and Silver Trail Information (see MP p. 277). 2:42 Crossing Stewart River. We crossed the river then turned left to Dawson City and YT-11 went to the right to Mayo and Keno ... slowed down for the 50 kph (31.1 mph) sign. 2:46 By the Stewart River. 2:49 Dry Creek - had a bit of water in it. 2:53 Passed the sign with camera on it (too fast) - Stewart River viewpoint ... Stewart River, a major tributary of the Yukon River. 2:58 Passing Moose Creek Lodge (MP p. 279) ... then crossing Moose Creek and climbing a hill. 3:02 Sign for a steep descent ... great overview of the valley and distant hills above the tree tops. 3:09 Lots of blue flowers off to the right (in my notes I suggested that the flowers might be flax, but now as I type, I’m thinking that they could have been the elusive Jacob’s ladder. 3:13 Crossing McQuesten River, a tributary of the Stewart River - plank bridge. 3:14 Falling Rock Zone ... forest - long, slender, white trunks of the aspens sure stand out ... the leaves are mostly at the top creating a canopy. 3:18 Mile 244.8 - Passing Partridge Creek Farm ... gorgeous blue sky with white fluffy clouds. 3:20 Passing the turnoff for McQuesten airstrip, El. 1,500 feet ... just a track through the trees. 3:22 Crossing Clear Creek - big creek. 3:23 Large patch of flax or maybe some other blue flower Near a pond on the right. 3:25 Swamp or slough ... flax ... pink roses. 3:28 Road Construction - Be Prepared To Stop. 3:29 Dawson City 111 km (69.0 miles). 3:30 Just a sea of blue - those bells again ... long stretch of gravel ... yellow flowers other than dandelions. 3:32 Some snow on the peaks way over to the right. 3:34 Passing Clear Creek Road. 3:35 Right of way cleared back again, but no big piles of trees - already been burned. 3:43 Pulling into Gravel Lake rest area and leaving. 3,387.9 3:52 Start of rough road. 3:55 Burn area to the left and trees dense to the right. 3:57 Meadow Creek - 1958 forest fire. 3:59 Around a corner and a view of distant mountains. 4:03 The sun has gone behind a cloud and it makes a difference in the temperature (though I think the air conditioner is turned on). 4:10 A burn area which looks to be fairly recent. 4:14 Mile 285.8 - hill, 9% grade. 4:15 - 4:22 Tintina Trench rest area ... Tintina Trench (MP p. 279). Upon leaving we go downhill away from the valley we were overlooking at the rest area. 4:31 Two rivers coming together - rapids. 4:32 - 4:34 Klondike sign. 4:35 Road curves right by the creek. 4:37 Driving along with the river to the right. 4:39 Passing the turnoff for the Dempster Highway (YT-5) to Inuvik, NWT ... the area is quite swampy. 4:40 Dawson City 40 km (24.9 miles) ... road crossing swamps. 4:42 Ditches full of water on both sides of the road - very much a muskeg area. 4:45 School bus sign and a house to the left. 4:46 Alongside a large creek again - momentarily. 4:48 Continuation of so much water lying around. 4:49 Henderson’s Corner and back by river (Klondike). 4:50 Open grassy area to the left - horses ... then back to creek - I guess we are going through the same valley. 4:52 Rock cliff to the left and Rock Creek to the right ... now seeing a number of houses scattered along the rout. 4:53 Dawson City airport to the left ... lots of little planes. 4:54 A photo op. in 2 km (1.2 miles) ... MP p. 279 - Hunker Creek dredging. 4:58 Tailings from mining both sides of the road ... go on and on. 5:00 Sign: Welcome to Dawson City ... and the tailings continue - acres of tailings. 5:02 Tailings continue ... gravel road. 5:03 - 5:05 Stopped for construction. 5:07 Dredge Spot Subdivision ... tailings everywhere ... tailings ... tailings ... tailings. 5:09 End of pilot car ... Holland America tour bus. 5:12 - 5:17 Dawson City RV Park and Campground on Bonanza Creek ... C$12.84 (Self). 3,443.3 5:20 Campsite - under a group of cottonwood trees ... this was next to the Esso Service Station with store and gift shop, and which operated the RV park and campground, also free high-speed internet service. For supper we had ground beef, onions and beans (I bought Jo a new can opener - C$10.70) with sourdough bread, salad with miracle whip and salsa dressing, also guacamole chips. 8:02 Leave to go into town. 8:04 Joining the highway and crossing the Klondike River ... more tailings. 8:11 Turned around by the ferry and driving up and down the streets. 8:20 - 8:45 Robert Service cabin, Berton home and Jack London’s. Drove back to the river front, parked and walked along the Millennium Trail to the confluence of the Klondike River with the Yukon River. 9:20 Dawson City bathed in sunshine. 9:21 Crossing the Klondike River and turning into campground. 3,449.9 End of the day. Back at camp I sat at the picnic table with my laptop so I could download some of Jo’s and my pictures. I tried to write CDs but got the message that I would be overtaxing the battery. I took the computer across to the washroom (roomy and very clean) where I was able to plug it into an outlet and write the CDs. In the meantime Sam took his laptop to find a location where he could make radio contact and thus be able to send an email to the family. 3,449.9 10:06 Leave ... we all had lovely hot showers this morning ... Jo cooked pancakes for breakfast. 10:07 Turning onto Bonanza Creek Road. 10:08 - 10:15 Bonanza Creek Historical Markers ... passing lots of tailings. 10:19 End of paved road. 10:22 Tailings all along the creek, all along the edge of the road. My leg or knee is already giving me pain this morning - My get-up-and-go has got up and gone! 10:33 - 10:38 Dredge # 4 ... see MP p. 289. 10:43 Turning into Discovery Claim. 10:45 Bonanza Creek Discovery Claim. Then we returned to Dredge # 4. 10:56 - 12:33 Great tour of the dredge (seniors $4.25 - C$12.75 - Self cash). 12:55 Back at the highway, Klondike Highway that is. 12:56 Passing the Bonanza Esso station and crossing the Klondike River ... road construction and pilot led convoys past the campsite and over the bridge. 12:58 Turning onto Dome Road. 1:06 - 1:18 Midnight Dome ... unbelievable views. 1:28 Back at the highway in Dawson ... passing 8th Ave. where Berton’s house was. 1:36 - 2:12 Jo and I walked along streets in Dawson City whilst Sam went to get gas. 2:28 Stopped for picture of miner and one of Front Street. 2:30 In line for the ferry to cross the Yukon River to the Top of the World Highway ... the car in front of us was from PEI. Whilst sitting in the car waiting to cross we have eaten our lunch. 2:50 Starting to drive down to the ferry. 2:53 Ferry leaving Dawson City ... the ferry is fighting the current, also the wind from upstream (ferry details: Allied Shipbuilders Ltd, Hull 159, 1967 Vancouver Canada. 3,485.7 2:58 Off the ferry and the start of The Top of the World Highway ... before day’s end we will be in Alaska, my 50th state! What a trip it has been so far and I can only imagine it getting better. What a climb up from the ferry - see picture of this road taken from Midnight Dome. When we were at The Dome I’m not sure that I realized that I was looking at the road we would be taking after crossing the river! 3:04 Crest of the main climb, then around a corner and climbing again. 3:07 Still climbing (wish I had my GPS with me!) ... start of loose gravel ... and the climb goes on! 3:08 Pavement ... still climbing ... lupines. 3:11 Up ... back on gravel and pulled into a rest area with Dawson City information booth, also interpretive markers about the Fortymile cariboo herd. 3:23 Back on the road and continuing the climb - gravel road. 3:26 Maybe the top of the climb ... flat, then up slightly. 3:27 Crest, then down ... magnificent views to the right of a mountain range which still has quite a lot of snow on it ... lupines in abundance ... road going along a ridge. 3:30 Road paved, but not in the best shape. 3:31 Around a corner and can see the road snaking round the top of mountains ahead, and still climbing in places ... the road is on TOP OF THE WORLD ... road a mixture of gravel sections and pavement. 3:40 Still winding around on top of the world. 3:41 Another climb ... also seeing some snow patches here. 3:43 Crest and continuing to follow the ridge line and can see the road in the distance. The road is also more or less at the tree line. 3:45 Snow fence - this is the third one that we have seen. 3:46 Crest and a two-foot bank of snow. 3:52 Start of another climb ... crest and going up once more for a short distance. 3:55 Down and another climb, each time going higher. 3:57 Rocky outcrops to the right ... MP p. 289 ... also a crest, probably the highest we have been. 4:00 At the bottom of a descent before going up again. 4:02 Pictures of Castle Rock ... can see a winding road across the gully. 4:04 More snow at the side of the road. 4:05 Snow bank along the road to the left ... passing Clinton Creek Road (MP p. 289). 4:06 Huge patch of snow ... we are above the tree line and there is quite a lot of snow along the road. 4:09 10-foot high snow bank ... then a steep descent. 4:11 Down at the tree line before ascending again. 4:16 Crest ... the road just keeps on and on, winding around, going up and down, and amazing views constantly. 4:19 Pictures just after passing Top Of The World sign. To me it is amazing how we can stay so high up in the mountains and going from ridge to ridge without having to descend into a valley. 4:27 We are practically above the tree line again and passing a cyclist, fully loaded, going in the opposite direction. 4:29 Milepost 86 km (53.4 miles) ... about 10 miles to the Yukon/Alaska border. 4:30 Rest area ... old log, sod-roofed cabin (originally supply and stopping place for the McCormick Transportation Co.
4:31 Passing 60 Mile Road south to old mine workings at Sixtymile ... we can still see the mountains we were looking at when we first started out from the rest area at the top of the initial climb. 4:34 Still up and down and round about - MP p. 289 “Top of the World Highway winds above timberline for many miles.”. 4:36 A steep winding descent, then up. 4:40 A picture through the front window. 4:41 More pictures ... snow bank as we descend. 4:43 Still above tree line ... snow. 4:51 Mile 64.7 - The Top, El. 4,515 feet (see MP p. 289). 4:54 At the U.S.-Canada Border, El. 4,127 feet, the most northerly land border port in the USA. 4:57 (3:57) Across the border and entering Alaska time - stopped for pictures. 3,551.2 3:57 - 4:08 Poker Creek, AK, pop. 2 ... I can’t believe it! I’M IN MY FIFTIETH STATE and what a way to come! WOW! It only took us 3,551 miles to get to this point! Leaving Poker Creek the road is downhill for 4 miles. 4:18 Leaving from the Welcome to Alaska sign where “toasted” with Nebraska wine our arrival in the 49th (my 50th) state. 4:24 Sign: Food, gas, lodging 1 mile. 4:26 Welcome to Boundary ... an old log building with a sod roof. Boundary Lodge was one of the first road houses in Alaska ... also Boundary airstrip, El. 2,940 feet, for private aircraft. 4:27 Going uphill, rough gravel ... still in the mountains, layer upon layer, still winding around and distant views, but not the same vistas as earlier. 4:35 Pretty impressive vista to the left ... also rocky outcrop on the left ... a lot more brush ... can still see the road snaking around in the distance. 4:37 Layer upon layer of mountains to the left ... the road is rough. 4:38 Going down and round a sharp corner, only to go up again ... crest ... down a little to the bottom and up. 4:42 Jack Wade Junction (Mile 95.7) ... Top Of The World Highway ends at its junction with the Taylor Highway, AK-5 ... north to Eagle and south to Tetlin Junction (Alaska Highway) ... Tok 98 miles. From here it looks as if the road descends a long way into a valley ... down, down, down. 4:48 Washboard road and still going down. 4:50 Stream to the right of the road. 4:52 More or less down in the valley ... stream becoming bigger ... but the road continues downhill through the bottom of the valley. (I forgot to change the time on my camera, therefore all those pictures since the border up until now need to be noted as taken 1 hour earlier). 5:00 - 5:03 Jack Wade Dredge - see MP p. 290, mile 86.2. BLM (Bureau of Land Management) - Department of the Interior ... Forestry comes under the Department of Agriculture. 5:07 Ducks at the edge of the creek to the left. 5:08 Burn area and still descending through the valley and passing the entrance to Walker Fork BLM Campground. 5:10 Crossing Walker Fork (mile 82.1) - quite a river ... then the road climbs after that long descent. 5:12 Looking down on a burn area both sides of the valley. 5:14 Big burn area to the right. 5:16 Still climbing and winding around the hills, big valley, South Fork valley, winding below - can see the burn area and the river as it winds through the valley, which, normally, we wouldn’t be able to see ... MP p. 290 (mile 76.8) fires in Alaska. 5:23 Mile 75.3 - Crossing South Fork Fortymile River - big river ... we are at the bottom of the valley. With the river to the left, the water looks to be flowing east - we are driving west ... looking at the map on MP p. 273, South Fork flows into Middle Fork to become Fortymile River which flows northeast to its confluence with the Yukon River. This road has very sharp turns. 5:28 Round an elbow curve and climbing. 5:31 Crest ... can see again the river to the left winding through the valley. 5:32 Another elbow curve and up and down ... up and down. MP p. 190 - Lost Chicken Mine, established in 1895 - first major placer gold strike was in 1896 ... before Klondike Gold Rush ... first gold was found in Resurrection Creek at Hope on the Kenai Peninsula. 5:37 Habitation in the valley ... dredge down below in the valley (MP p. 290) - the old Mosquito Fork Dredge. 5:38 65.9 - Entering Chicken Community, pop. 25 - Nice people and 1 old grump. 5:39 Turning off the highway to drive through Chicken. 5:41 Pedro Dredge No. 4 ... turned around. 5:43 Back at Taylor Highway, which goes from Teslin Junction to Eagle ... the Top of the World Highway had ended at Wade Junction. 5:46 Mile 64.3 - Crossing Mosquito Fork of the Fortymile River and we are starting on a paved road ... it has been all gravel up to this point. 5:47 Another burn area - very extensive up hill and down dale. 5:50 Moose ... lots of white flowers among the burned trees ... big burn. 5:55 Sign for a steep grade uphill and the burn area continues ... a couple of patches of gravel road. 5:57 Another crest, then a fairly straight roller-coaster road. 6:01 More rolling type country, but there is a mountain range ahead with snow on it - a broad valley between here and the mountains. 6:05 Mile 49.3 - Crossing West Fork of the Dennison Fork of the Fortymile River. Mile 49.0 - Turning into the West Fork Campground and looking around for a suitable site. 3,611.1 6:08 Backing into a campsite and setting up camp. Sam went off to register and pay for our campsite, a whopping $4.00 with our Golden Age Pass. The last pictures for the day were taken at 11:40 PM. After arriving at camp two or three rather grubby people went by and a white, long-haired old man stopped with his dog, Johnny, to introduce himself as Don Marshall, the Camp Host. He wanted to know if we wanted any wood for a campfire. I wasn’t too sure what to think about other people in the campground! After supper Jo and I went for a walk looking for moose near the lake below the campground, and, at Don Marshall’s suggestion we were wandering through the trees at the top of the cliff where there were other camps. We stumbled upon the camp next to Don where some of the people we had seen earlier along with others (about 10 altogether) having supper at a picnic table which was completely enclosed by a large tent of mosquito netting. They invited us to join them and get some respite from the hungry mosquitos, finding crates and buckets for us to sit on. What an interesting group of people they turned out to be, proving that you can’t always judge a book by its cover! Except for another visitor, a guy from Brisbane, Queensland, they were all mushroom pickers from different parts of The States and were there to pick morels in the burned forest - largest fires in Alaska’s history. Larry Evans of Missoula, Montana, (biography - http://www.fungaljungal.org/IJones.htm) seemed to be the leader of the group. He is a member of the Western Montana Mycological Association and has a web site about wild mushroom sales and Educational Projects to teach people about fungi. They had morels by the bucket and were using crates for drying and storing them. When Don joined us all, Larry asked him about his Spanish galleon slide show and Don went off to set things up. He got out his generator so he could run the projector - there was no electricity of any sort at the campground - he put up a white sheet in a large tent he had at the side of his camper and arranged as many chairs as he could. A veteran of the United States Marine Corp and an Iwo Jima survivor, Don’s hobby is Spanish galleons, their history and their demise. He also claimed that he is pretty sure that he has evidence of a galleon which went off course near Astoria, Oregon. He also proudly showed a small brass canon from a galleon which he has in his possession. Another item of interest was Manilla beeswax, a prized item in Europe which was often part of the cargo of Spanish ships returning to the Old World. The wax did not deteriorate in salt water and, if washed ashore, could signal that a Spanish galleon may have been sunk nearby. I can’t remember the rest of the details offhand ! 3,611.1 8:46 Leave ... small bird at the campsite this morning was a phoebe. 9:00 Mile 43 - Crossing Logging Cabin Creek ... burn area continues and it is very interesting looking at the hillsides and how the fire has missed some areas. These fires burned more forest last year than in any previous year - 1,600,000 acres and the mushroom pickers were here to take advantage of gathering morels from the forest floor. It was no wonder they looked grubby, and the more so since the campground did not have any shower facility! 9:15 Sign ... steep descent. 9:18 Another big burn area and at that point the mountains were ahead of us. 9:20 Sign - 9% downgrade. 9:25 A heavily burned area ... road dips down steeply to a valley and up the other side. 9:27 - 9:34 Interpretive panels about the Fortymile Cariboo Herd. 9:48 Picture of the Tanana Valley State Forest sign. NOTE: look up the definitions for duff, tundra and muskeg. duff - decaying leaves and branches covering a forest floor. tundra - a treeless area between the icecap and the tree line of Arctic regions, having a permanently frozen subsoil and supporting low-growing vegetation such as lichens, mosses and stunted shrubs. muskeg - a swamp or bog formed by an accumulation of sphagnum moss, leaves, and decayed matter resembling peat. 9:51 7% downgrade ... also game management area ... cars parked at intervals all along the roadside and we have decided that people are out there mushrooming. 9:56 Cuttings (sandy) with names in small stones or rocks ... we seem to be getting closer to the mountains ... names continue ... people looking for mushrooms ... mix of vegetation on the south facing slope ... another car. 10:00 Road descending into a valley. 10:02 - 10:03 Two pictures - Alaska Range and Tanana River in the valley ... cuttings continue to be sandy. 10:05 STOP - junction with and turning to the right onto the Alaska Highway, Tok 12 miles, Fairbanks 217 miles, Anchorage 347 miles, and a left turn for Canada. 10:07 Passing information signs and looking along the valley ... then crossing the Tanana River - wide (mile 1303.4) ... also seeing Jacob’s ladder (?) again along the road - very pretty with the purple plus the snowy mountain range in front ... road fairly flat as it goes through the broad valley. MP p. 206 - Tok fire of 1990. 10:13 Communication towers - 3 towers to the right (see MP p. 206, mile 1308.5). 10:14 Crossing the Tok River which flows 60 miles to its confluence with the Tanana from its headwaters at the Tok Glacier in the Alaska range ... white flowers, roses and lupines. 10:19 1312.6 - Entering Tok ... (1313.1 - Gateway Salmon Bake, where we camped on the return trip. 10:21 - 10:50 1314 - junction with the Glenn Highway) ... Tok State Information Visitor Center. MP pp. 209 to 216 - Tok. 11:00 Airfield - MP p. 217 (mile 1324.6) ... and the mountain range runs at a 45° angle because it is now to our left as well as straight ahead. 11:05 Leaving the flat valley and going into the foothills. 11:08 1331.9 - Passing Moon Lake State park campground ... driving along the base of the mountains, still with a lot of snow on them. 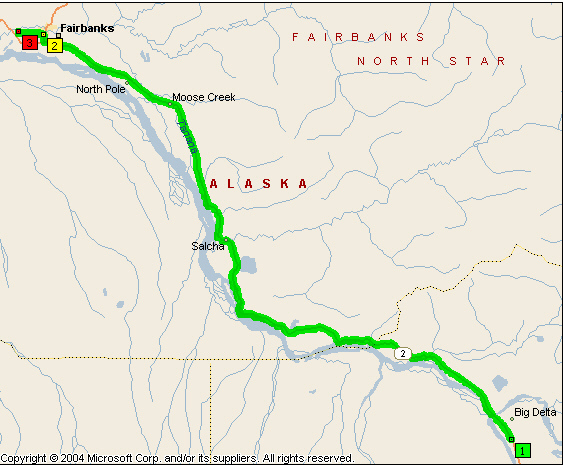 Jo and Sam say we will be skirting around the mountain range pretty much all the way to Fairbanks ... few roads actually cross over the mountains. 11:15 A mature bald eagle ... driving through mixed forest, the mountains seen between the trees. 11:21 Delta Junction 80 miles, Fairbanks 175 miles. 11:22 - 11:38 1344.4 - Rest Area - many pictures ... Mount Hayes, 13,832 feet, Hess Mountain, 11,940 feet, Mount Deborah, 12,339 feet. 11:41 Robertson bridge - 1347.5 - Crossing Robertson River, 33 miles long from Robertson Glacier in the Alaska Range to its confluence with the Tanana River. 11:43 We seem to have left the mountains behind or at least they are further back from the road. 11:45 The first fireweed (Alaska’s state flower) we have seen. 11:47 Descending to another flat stretch and crossing a muskeg area. 11:50 Bluebells in flower along the right of way. 11:53 Mostly deciduous trees, but there are some conifers. 3,718.8 11:57 1361.3 - Dot Lake, pop. 33 ... Historic Milepost 1368 - MP p. 218. Sam was explaining about Alaska’s Native Land Corporations (not reservations) which are owned and operated by the indigenous peoples, being settled in the early 70s - they were allowed to establish their own school systems. There is very little private land, it all being owned by the Federal Government ... lot of animosity between Alaskan and Federal Government which was snatching up all the good land - land Claim Settlement (requires more reading and further study on my part - having lived in Alaska Sam & Jo knew a lot about this subject). Mile 1370.8 - Tanana Valley State Forest (paper birch, poplar, spruce) - 1.81 million acres (MP p. 218). 11:59 Now we have mountains ahead again. 12:12 - 12:14 Pullout near Sears Creek. The road is virtually following the valley at the foot of the foothills. 12:15 Getting closer to the mountains again. 12:18 Dry Creek, and it is dry with a sandy bottom. 12:21 1380.5 - Crossing Johnson River, a tributary of the Tanana River, - wide, sandy but little water in it. 12:22 Yellow pond lilies blooming on a pond to the left. 12:26 - 12:52 1385 - lunch stop. Jo used a large rock as a table to prepare lunch - ham and lettuce sandwiches with carrots and port wine cheese spread ... I wasn’t much help, as usual, because I took the opportunity of photographing a variety of flowers, also a moth, possibly some kind of Sphinx Moth, on the dandelions. Whilst here three big motor homes pulled in from California (Modesta area), all with cars behind them ... several others passed. 12:56 Crossing Little Gerstle River ... milepost 1389 - long straight stretch of road. 1:00 Gerstle River Bridge (MP p. 218 - 1392.7) - Black Veterans Memorial Bridge - a very wide river, sandy and pebbly but little water. There are some very high peaks behind the initial mountains. 1:06 1399 - Morning Star B&B ... Gift Shop ... still on long straight road. 1403.6 - Sawmill Creek Road - a glimpse to the right revealed the barley. 1:11 1403.9 - Crossing Sawmill Creek and continuing straight ahead. 1:20 1412.5 - Passing Mountain House Lodge ... Delta Junction 10 miles. 1:21 Grain elevators to the left. 1:23 Horses - baby foal feeding ... school bus ... mail boxes and habitation. 1:26 Farm - cattle and horses ... still on straight road - maybe a slight curve! 1:28 1420.2 - Entering Delta Junction, roadside lined with daisies. 1422 - junction of Alaska Highway (AK-20 with Richardson Highway (AK-4) from Valdez. 1:31 We turned around to return to the Visitor center ... colorful banners on the light standards in Delta Junction. 3,779.6 1:32 - 2:18 Visitor Center and end of the Alaska Highway ... 80° ... (spent $10.00 - postcards, Alaska Highway certificate and a key ring). 2:19 Turning onto the Richardson Highway (AK-4) and going south ... 80°. 2:21 Crossing Jervis Creek - pebbly but some water. 2:22 Missile silo up a dirt road to the left. 2:26 Turned around at the main entrance of Fort Greely, established 1941... has extreme temperatures ranging from -69°F to 91°F ... (see MP p. 475). 2:27 Airport to the right, probably for Fort Greely ... Denali Fault to the left (also p. 475) After turning around it was about 5 miles back to Delta Junction. 3,789.0 2:32 Back passing the Visitor Information Center and the junction with AK-2. 2:33 North Pole 82 miles, Fairbanks 95 miles. 2:34 Turning into Delta State Campground. 2:38 Backing into a suitable campsite - $10.00. The campground had a single pit toilet in a very large room, and other than one tap outside for getting water, there was nowhere to wash hands nor clean teeth - it would be our second night of really roughing it! We set up the tent, made the beds, then sat trying to make up our minds about what to do! 3:59 Leaving the State Park we turned left to return to Delta ... have now been in Alaska for 24 hours! 4:03 - 4:23 IGA supermarket to restock the pantry (Jo - $10.13) ... I tried to call LP from the pay phone but Onesuite doesn’t work from Alaska and I was feeling very upset. I am wondering about the job situation, whether he has one or not! 4:25 Back at camp ... Jo made a beaut supper along with Sam’s help in preparing the charcoal for the BBQ - chicken, rice, salsa, dried mushrooms in foil, which took about 25 minutes to cook, and we had fruitcake for dessert. 3,792.3 6:43 Leave camp, but were held up by a large 5th wheel which we watched being maneuvered into a camp site! 6:48 At the highway (AK-4) we turned right (north) ... there are a lot more clouds in the sky tonight ... lots of log houses and/or buildings ... lilacs blooming ... also new log houses under construction. 6:58 Turning into Big Delta State Historical Park. 6:59 - 7:53 Rika’s Roadhouse and Landing. Although the Roadhouse, which is now a gift shop, was closed we were able to walk through the grounds. We went into the barn and around other buildings on the property and along the Tanana River. It was a most interesting place and will probably stop there again in the morning. 7:54 Back at the highway and leaving the Park, we turned north again. 7:55 - 8:07 Stopped just before the Big Delta Bridge over the Tanana River to view the Pipeline Crossing ... Pump Station 9 and interpretive signs. 8:08 Crossing the Tanana River. 8:09 Turned around at Hansen Hollow Road and returning south across the bridge. 8:10 Passing Big Delta State Park ... the peaks to the right still covered with snow - the Alaska Range, which is also the range with Mt. McKinley in it. 8:19 Turning left on Jack Warner Road, a straight paved road running east ... lots of homes back behind the wood ... also numerous unpaved side roads ... churches ... trailer homes. 8:27 A curve in the road and now going southeast. 8:27 Turning left on Remington Road and going east again - still lots of places out here. 8:28 Turning right on Clearwater Road and going south. 8:30 Nistler Road - here we turned west to return to AK-2. 8:31 Stopped for pictures of open fields with the mountains in the background. 8:34 More grain fields ... the sun is still so high in the sky, but is hiding behind clouds. 8:40 Passing Delta Junction School. 8:41 Back at the highway (AK-2) and turning right. 8:43 Turning into the campground. 3,825.5 8:44 “Home” for the night ... end of the day. 3,825.5 8:50 Leave camp ... breakfast was cereal and toast with apple butter. We weren’t up until 7:15 so had breakfast, packed up camp and were on the road in record time. Last night it seemed to be daylight all night and I did not sleep well ... my leg and right knee hurt a lot. 8:53 Turning onto the highway, Richardson Highway - (AK-2) ... we could see the very high, snow-covered mountains as we pulled out onto the highway. 9:02 Turning into Rika’s roadhouse. 3,833.8 9:03 - 9:51 Gift shop at Rika’s Roadhouse ... we also walked around a bit more in search of Rika’s grave site. 9:52 Leaving the park and back on the highway at MP 275. 9:53 Crossing the Tanana River, Big Delta Bridge, and passing the pipeline. 9:55 Passing the turnoff for Quartz Lake (Mile 277.9) - see MP p. 277. 9:58 Still seeing Jacob’s ladder (vetch). 10:03 Moose on the right. 10:04 Turned around to go back to the moose. 10:08 Turned back ... wild irises. 10:10 MP 285 - moose. 10:11 Shaw Creek - lots of boats. 10:12 Driving along the Tanana River, a broad, flat, sandy river bed, but there is also a lot of water ... mountains to the left. 3,853.1 10:15 - 10:21 MP 291 - stopped for roadwork ... leaving with a pilot car. 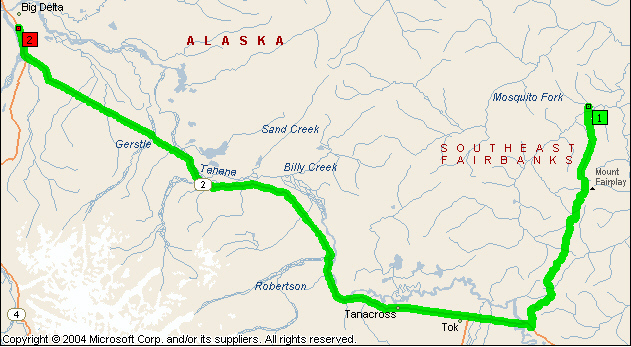 10:28 The road is climbing and there is even a passing lane ... crest then downhill for 1.4 miles ... Fairbanks 69 miles. 10:30 Passing the signs about the Tenderfoot Mining Area - see MP p. 477, Mile 294 for excerpt from the sign. 10:31 Entering Fairbanks North Star Borough. 10:32 Crossing Banner Creek, an historic placer gold stream. 10:33 Passing another recommended camera stop overlooking the river and the mountains beyond. 10:35 Forest, pretty good height - mostly dead with some good sized spruce ... start of a section of gravel road. 10:37 More roadwork - Be prepared to stop! 10:38 Stopped, but the flagman immediately turned his sign to SLOW ... gravel. 10:40 Back on pavement ... crest with distant view ahead. 10:44 Passing Birch Lake Military Recreation Site. 10:45 Passing a rest area overlooking the lake - a pretty lake, lovely area. 10:48 Cyclist pulling a trailer. 10:49 7% grade ... ahead cliffs coming down to the road. 10:50 The road is at the base of the cliffs with road to the left ... lots of water. 10:52 Leaving the cliffs but immediately a rest area with Historical markers - passed. We always seem to be in a rush! See MP p. 278 Mile 313.1 for excerpts of the markers. It stated that Fairbanks became Alaska’s largest city, but Sam said that Anchorage is now the largest city, followed by Fairbanks, then Juneau and Ketchikan. However, for Fairbanks (pop. 30,224) to come in ahead of Juneau (pop. 30,711) College (pop. 11,402) has to be lumped in with Fairbanks. Also, from looking at the AAA Atlas I found that Ketchikan population of 7,922 is surpassed by Sitka with 8,835. 10:54 A burn area to the right. 10:58 Harding Lake to the right. 10:59 North Pole 30 miles, Fairbanks 44 miles. 11:01 Mile 322.2 - Salcha, pop. 387 ... Salcha River Lodge. 11:02 Crossing Salcha River - a good sized river and a clear one, too. 11:05 Passing Salcha Elementary school ... Salcha is spread out along the highway. 11:07 A house on the left has half a dozen horses. 11:08 We have cliffs to the right again ... still the Tanana river. 11:12 A lovely display of wooden creatures made from logs with burls - The Knotty Shop. 11:14 Alaska cotton all along the road - to me it looks like an everlasting type thing - it goes back into the woods as well as being along the right of way. 11:18 Eielson AFB airstrip on the right ... four-lane divided highway begins. 11:20 Turnoff for Eielson Air Force Base, pop. 6,000 ... see MP p. 478. 11:26 Long bridge over the Chena Flood Channel ... see MP p. 481 Mile 346. 11:28 North Pole City Limit. 11:29 Leaving the highway for the North Pole Visitor center. 11:30 - 11:53 Visitor Center - free coffee and washroom ... a very informative fellow manning the counter. 11:54 Going straight across the highway, then turning north. 11:55 - 12:22 Santa Claus House, North Pole, AK 99705 ($5.15 for ornament and $10.35 for Denali book). Inside Santa Claus House a lit sign shows the count down to Christmas. 12:25 Back on the highway and continuing north to Fairbanks. 12:28 Fairbanks 11 miles, Circle 168 ... blue flowers (?) In the median ... commercial places (untidy) all the way ... all kinds of equipment, lumber. 12:34 Roadwork ... left lane closed. 12:35 Irises at the side of the road - lots all along road. 12:36 Passing Fort Wainwright ... stopping - more irises. 12:37 Train - oil tanks ... irises. 12:38 Fairbanks 3 miles ... irises. 12:41 Passing the turnoff for AK-3 to Denali, also Nenana - actually our exit and overpass ... more irises. 12:42 End of roadwork ... lots of irises ... also Welcome to Fairbanks, the Golden Heart City. 12:43 End of Richardson Highway. 12:44 The road continues as the Steese Highway to Circle after Airport Way, west, and Gaffney Road east. We are stopped at a traffic light and will be turning left onto Airport Way ... back in the big smoke! - Traffic lights AND traffic after being out in the wilderness! 12:45 Turning onto Airport Way. 12:46 Downtown or Old Fairbanks to the right - Gillam Way ... lilacs in bloom. 12:53 Stopped at University Avenue, a very long traffic light. 12:56 Turning around at Pile’s Landing ... 81°F. 12:58 Fairbanks Welcomes You (from the southwest or for those arriving by plane) ... lilacs blooming in the median as we drive back along Airport Way. 1:03 - 1:40 Wendy’s for lunch ($5.99) ... Jo got a signal with her cell phone and finally I was able to talk to LP - HE HAD A JOB and I burst into tears! 1:42 Back on Airport Way and going east. 1:45 Turning onto Cushman Street. 1:46 Booked in at the Best Western Fairbanks Inn (Room 100) ... had to take our stuff in through the main entrance which was up a short staircase. 1:56 Leaving to go to the Tanana Valley Farmers Market on College Road. 2:00 Crossing the Chena River. 2:02 Turning left on College Road. 2:08 - 2:30 Farmers Market (see MP p. 431) We were interested to see one of the vendors selling wild morel mushrooms. To me, Fairbanks seems to be very spread out ... houses on the hills overlooking the city. 2:45 - 3:10 Wal*Mart - $6.55 - bought stuff bag for my sleeping bag, also card for grandson’s birthday ... Sam’s Club, Lowe’s, Wal*Mart, Home Depot all seem to be congregated in this part of town. 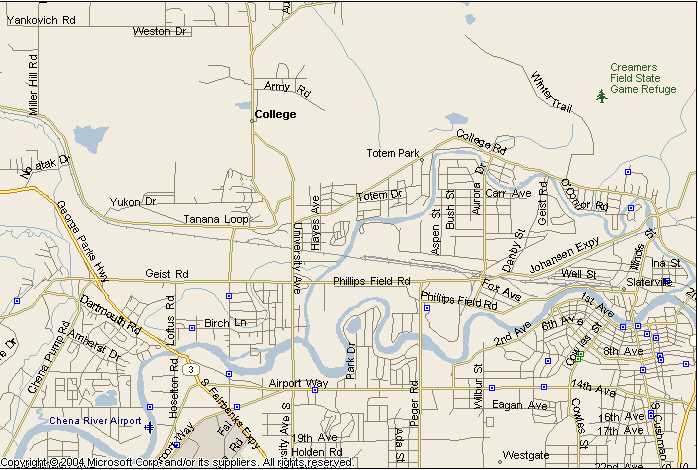 3:14 Johansen Expressway - Exit-4 for College Road ... turn right on Illinois. 3:19 Left at Airport way. 3:21 Right at Cushman Street. 3,945.4 3:22 Back at the Best Western. We were staying at a motel (hotel) so we could all have showers and do some laundry (after being on the road for nearly two weeks we needed some clean clothes). 7:50 Leave for supper ... 75°F. 8:04 - 9:05 Airport Way Family Restaurant - $10.30 (cash). 3,950.1 9:11 Back at the Best Western - end of the day. 3,950.1 10:00 Leave from Best Western Fairbanks Inn. We had a terrible night it being so hot we were sweating all night and hardly slept. I lodged a formal complaint about the air conditioner, also the fact that there was no Kleenex and light bulb missing from above the vanity. I did take a picture of the notice board in the foyer before leaving with Sunday’s forecast - possible scattered showers ... High 75°F (Record 91°F) ... Low 54°F (Record 17°F) ... Sunrise 3:05 am ... Sunset 12:37 am ... Daylight 21 hours 31 minutes. It rained during the night and it is cloudy this morning. 10:05 - 10:55 Denny’s ($8.65 cash). 11:00 From Denny’s we went west on Airport and turned right onto University and right into Chena River State Recreation Site campground to check it out. 11:09 Back at Airport Way and turning right on the service road. 11:10 Turning into River’s Edge RV & Campground. 11:17 Left River’s Edge and back on the road. 11:20 Back on University (opposite Chena State Park). 11:25 Passing Denny’s ... 56°F. 11:27 Turning left on Cushman Street. 11:29 Turning off for the Visitor Center. 11:30 - 1:00 Visitor Center (corner of Cushman Street and 1st Avenue). After parking the car a man came up to us saying he had followed us up Airport Way, along Cushman and onto 1st Avenue and parked behind us just so he could talk with us. He introduced himself as Doug from Waco, Nebraska ... said his last posting with the military before retiring was in Alaska ... then he was hired as a contractor for the building of the new hospital at Fort Wainwright. After spending time in Golden Heart Plaza and at the Visitor Center we walked across the street to an Art Gallery. Leaving from the Visitor Center we drove around looking at buildings listed on the Walking Tour (Jo had to return the pamphlet to the Visitor Center as they did not have extra copies). An iron fence along the river front was very attractive. We did not stop to take any pictures. 1:11 Crossing the Chena River on the Bridge of Flags ... Cushman becomes Illinois St.
1:20 Entering University of Alaska Fairbanks Campus. 1:24 Passing reindeer, also a baby ... Sheep Creek Road. 1:25 Turning right on Miller Hill Road, then right onto Yankovich Road. 1:28 - 2:50 Robert G. White Large Animal Research Station, University of Alaska Fairbanks Institute of Arctic Biology. We had a wonderful tour here ($9.00 senior) and particularly enjoyed seeing the muskox babies as well as cariboo. Whilst here we even saw some sandhill cranes fly overhead. From here we continued along Yankovich, turning right on Ballaine, then left onto Farmers Loop Road and Tanana to the University. 3:07 - 4:32 UAF Museum of the North, a truly unique museum - most interesting, but a place which I think a person could visit many times to absorb all that is to be seen. The museum was actually fabulous - all about Alaska and the various indigenous peoples, animals, minerals, etc. Focal point near the entrance is the nine-foot brown bear. It is huge. Reproduction: Females usually breed every three years between May and July. One to four cubs are born eight months later. Food: Plants, berries, carrion, fish, mammals. 4:37 CT Elvey Building - Geophysical Institute (where Steve Geller used to work) and from here we descended the hill to Tanana East Loop. 4:43 Turn right on University. A left turn would take us onto Farmers Loop Road. 4:47 Turning into Chena River State Recreation Site as this is where we had chosen to camp in Fairbanks. We drove round and round trying to find a suitable site, not too far from the toilets and preferably with power. 3,977.0 5:04 Pulled into a site and set up camp. 3,978.7 Back at camp after shopping then Sam went to get gas ready for tomorrow’s adventure to the Arctic Circle..
3,984.3 9:30 Leave for drive ... turn right on University, then right on College and turning left at Danby ... Alaska Department of Fish and Game - wildlife and birds. 9:40 - 10:17 Viewing area for Creamer’s Field Migratory Waterfowl Refuge ... saw some sandhill cranes in the distance. 10:23 Back on College after driving up to the farmhouse. 10:27 Passing University Avenue as we continue to the lookout at the University in the hope of being able to see Mt. McKinley - no such luck. Wood River Butte can be seen from this lookout as well as Mount Hayes, 13,700 feet, Hess Mountain, 12,030 feet and Mount Deborah, 12,540 feet. 10:40 Back at University and College, south on University, cross Chena River then into the campground. 3,995.7 10:45 Back at camp ... end of the day.